Many things around us are hard to understand but very effective in nature. 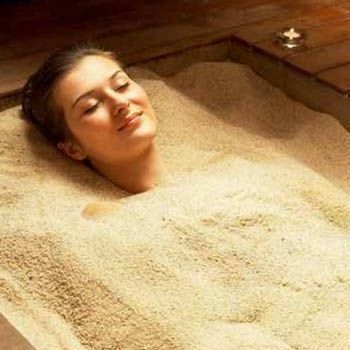 Sand bath is a great idea if you are living near sea and are suffering from various diseases. It is very unusual and surprising thought to take a hot sand bath in unbearable heat of 80 degree Celsius. In other words of thoughts, it would be better to say that sand bath is the method to bury oneself in hot heated volcanic stand right up till neck that helps you to relax yourself and enjoy warmth of sea sand. It does not burn your skin but makes it clear and glow that one could only dream to have. It has got high beauty effect that is impossible to hide. It is not an easy thought to bury oneself in such heated sand and relaxing with sound of sea waves. It makes you feel so relaxed and comfortable that gives you extra fresh and glowing looks. No science can explain the beauty effect of hot sand bath that makes it harder and surprise to believe when it comes to its effects. It has been seen that many people have get themselves cured from various skin incurable diseases with help of hot sand bath. It is also very effective to cure major diseases such as back pain, shoulder aches and muscle pulling pains. Many people have claim that they got cured from diseases that were medically impossible. After being buried in hot sand you may get rid of diseases that take more than 10 to 20 years to get cured. Weight of sand that lets one to sweat and perspiration makes sand bath the most operational and effective technique that had been carrying out for more than 300 years by Japanese and other people. No one needs to spend heaps of Dollars to get bitter medicines but just give your body few hours of relaxing session that will make you feel healthy and fresh. About 500 to 5000 people visit different hot sand bath spa to get all of its benefit. No one needs to spend money on consuming procedures when you can get all benefits in just few hours of relaxing by hot sand bath. In fact, hot sand bath increases body temperature. Increase of temperature affects heart beat rate and thus, results into increase in blood circulation. This increase in blood circulation relieves body muscle from such painful diseases with help of heat that can’t ever be created with any kind of medicine. Higher blood circulation in body results in discharge of all waste from body and also maintains sufficient oxygen level in body. It leaves permanent effect on body thatmakes one person to say good bye to each and every medicines that has made his life hell. It would not be wrong to say that hot sand bath has got power to throw away doctors from your life.